It began with coin toss. The coin came up tails; I was heads. Had it gone my way, there might not be a story at all. Just a chapter or a sentence in a book whose greater theme had yet to be determined. Maybe this chapter would have had the faintest whisper of love about it, but may not. Sometimes, a girl needs to lose. My own sentence review? 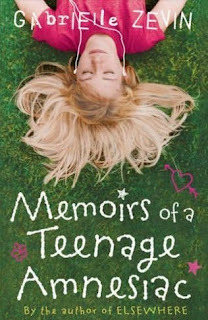 A fall down some stairs leads Naomi, a junior in high school with no memories of the last four years. With the help of her family and friends she tries to piece together who she was, who she is and who she will be. I've been on a roll with the YA this last six months. I tried Gabrielle Zevin's other book, Elsewhere and it didn't stick, but this one did. I mentioned a few days ago that when I'm choosing my next book to read, that I'm usually interested in a achieving a particular emotional response. I think I needed to read a book about confusion and identity and love at the moment. So this was the right book for me, at this time. That's not to say that I absolutely loved it, and couldn't put it down, but I liked it. Quite a bit. Some things were a bit predictable and I certainly enjoyed the first half of the book to the second, but what I liked most about this book is the whole concept of identity. It's a topic that comes up quite a lot in YA, the struggle of becoming your own person, this just has that added little twist of you know, head trauma and memory loss to make things more interesting, not to mention funny. One particular scene where her boyfriend gives her sweatbands as a token of their relationship had me in stitches. What always draws me to YA is the not belonging. It's easy for me to relate to not belonging. And I think Naomi really struggles with that in this book. Being an orphan, losing her memory. It's hard for Naomi to really identify who she is as a person, when she cannot remember her best friend, her boyfriend. The fact that her parents are divorced, her father is remarrying. She cannot remember why she liked yearbook, photography, her friends. So she tries to forge a new identity with a different boy, a different hobby, different friends. But the two versions of herself have to collide at some point. It was a fun story and a good companion over these last couple of days. Keris - Ha! I don't think anything would stop me from reading it. You know you can preorder the book at Amazon? If it had a photo, I might have already done that. You know, I knew that. I just needed a reminder. Very exciting about being on amazon. Shame it doesn't have the cover up, because the cover looks amazing!